One hundred years ago today, a Bolton private (formerly lance corporal) named James Smith fell to his countrymen’s guns on Belgian soil during World War I. A career soldier since 1909, Smith had served honorably in India and Egypt before the war. He had the hardiness and luck to survive Gallipoli and the Somme — but their horrors broke him mentally. According to this biography, “Jimmy almost lost his life on the Somme on 11 October 1916 when a German artillery shell exploded, burying him alive and causing a shrapnel wound ‘the size of a fist’ on his right shoulder.” When he returned from two months’ convalescence leave his mates could see that shellshock had destroyed the old Jimmy Smith. Erratic behavior that cost him his good conduct badges culminated in a break on July 30, 1917, the eve of the frightful Battle of Passchendaele, when Smith deserted his post and disappeared from the front — to be found later, wandering in a nearby town. In World War I, such an offense invited the brass to make an example of you. 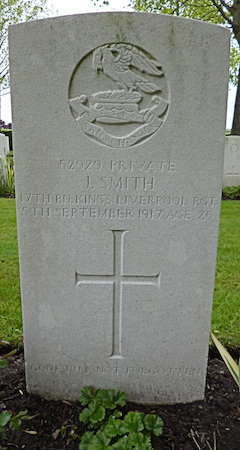 Smith’s own comrades from the 17th Battalion King’s Liverpool Regiment were drafted into the firing squad. Pitying their victim, the executioners pulled their shots and missed the target, only succeeding in wounding the brutalized private. When the firing squad commander faltered at his duty to deliver the coup de grace, the task monstrously fell on a close friend of Smith’s, Private Richard Blundell, to press the revolver to Smith’s temple and blow out his brains. For its service to the war effort, the firing detail got 10 days’ R&R … and a lifetime of shame. According to historian Graham Maddocks, in his book Liverpool Pals, William Blundell asked his father in a more lucid moment what he meant. Still desperately upset seven decades after the incident, the dying Richard told his son what had happened. It was clear, that as he faced his own death, Richard had never forgiven himself. Jimmy Smith was the subject of a 1998 play, Early One Morning.